I was born in Lahore sometime in the mid-Forties. My father worked for a bank near Anarkali Bazar. He just went there for the job. He was lucky to escape during the Partition of India with his life, wife and me. My father had a Persian wheel manufacturing and installing shop in Kaithal . We used to live on Karnal Road, near some Electric Generation Plant. Kaithal had only one cinema, Hind, owned by R. C. Khanna. I did not get to see a movie there. Our ancestral home is in a village called Jamalpura near this city.Our ancestors really came from a village near Amritsar during the 18th century when Jamalpura was established by Jamal Khan, a nawab of Maler Kotla . The village population was about 2/3 muslim in the fifties. It is probably even more now. Our family has moved to Khanna. The city had (still has only) 2 cinemas then, both owned by Dogar Mal. The older one, Moti, was in fact called Dogar dii Talkie. I saw my first movie here. It was Shrimatiji (1952). I remember only one scene in which there were some people in an open vehicle that fell into a swimming pool. We lived in various locations, Wakefield Gunj, Miller Gunj, Dera Kalsian. The city of Ludhiana had six cinemas in 1956, Raikhy, Naulakha, Minerva, Society, Kailash and Deepak.My father's mother's uncle's son (not making it up!) had the roofing contract for Laxmi (the seventh) that was being built then. Saw my first English movie, The Lost World, in Ludhiana. I did not understand much. Only one sentence spoken by an American actor remains in memory. He pointed to a gun and said, "This is a gun. It shoots bang, bang, bang!". I have yet to see it again. I lived on campus in Bhatanagar Hall (Boys Hostel No. 3). The hostel-in-charge was Vishwanath Tiwary, who was tragically killed during the extremist phase. We were not allowed to be out after 10 pm. Of course, we saw late movies in Sector 17, walked back for fun and entered the hostel through a not-so-secret opening made just for this purpose. Had great fun here, being first time away from parents. Lived near campus in various locations. One of them was Mrs. Miller's Palace. She was a nice old Jewess who always had room for one more Indian. One of my fellow students, first class first from Nagpur, quit Physics after first year and did Master's in Computer Science. He immediately started making more money than his advisor! My room-mate was Shashikant Phatak from BARC. He had lots of left-wing extremist friends who had endless discussions on how to change the world. I briefly fell under the spell of some right-wingers, but returned to the middle soon enough. We have always remained good friends. Saw lots of Hollywood movies. Fell in love with Marx Brothers and Woody Allen. After landing in India during March 1975, spent some time with my father and discussed marriage plans. On June 25, 1975, I was traveling by train to Bombay, when the headlines screamed of Emergency. I immediately rememeberd a line from the Navarang song, tum pachhim ho, in which the poet says something like, is dharatii me.n janame the saadhuu, us dharatii me.n janame Dictator. Leave it to the Nehrus to prove a poet wrong! Lived in the Hostel near the TIFR campus. Saw lots of old Hindi movies. Every Sunday, I would scan the ads and proceed via local trains, scooters and taxis to find the theaters and see the movies. Went as far as Thane. Saw many movies in Alexandra, Taj and other cinemas in the infamous red-light district. Saw Albela once in Jai Hind (I think, in Lal Bagh) and three times in Maratha Mandir (where it moved to) and Sholay eight times in Minerva. Saw lots of non-English movies via a movie club. Started building my song collection. Orderd a copy of Geet Kosh (Volume 3) from Har Mandir and instantaneously became his biggest fan. My music taste changed to the era of 1930s and 1940s. Got married in 1977 and took up a lecturership here. Very nice place. Liked it a lot. Had fun ordering books and equipment and designing new courses and labs for the new Physics department in the new university. Published lots of papers, which gave stomach-ache to some people. 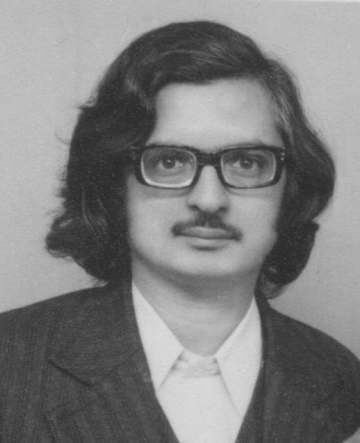 Decided to leave in 1981 and left in 1983 for TIFR again. Jaideep was born there. Raj Kumar Pathria stepped in to change the course of my life a second time. He had an opening for a post-doc and I came. Worked very hard and wanted to return to TIFR. Some fishy business happened (I am not the only one; others report similar experiences with TIFR; details later; watch this space!). So, went to US instead. Lived in Married Students Apartments. Lots of Indians and they all had multi-system TVs and VCRs bought from Jackson Heights. Rajdeep was born there. Professor Wilse Robinson was a very famous Physical Chemist and he had students and post-docs everywhere. He spent about 20 years at Caltech! I was happy to help him in his laboratory building theories for what they did. Learnt about PCs and UNIX. Found out about India News by email and RMIM. Lived close to campus on 10th street. Jaideep went to Lubbock High, the same school where the Rock Legend Buddy Holly went to school. Raj Kumar Pathria changed my life for the third time. 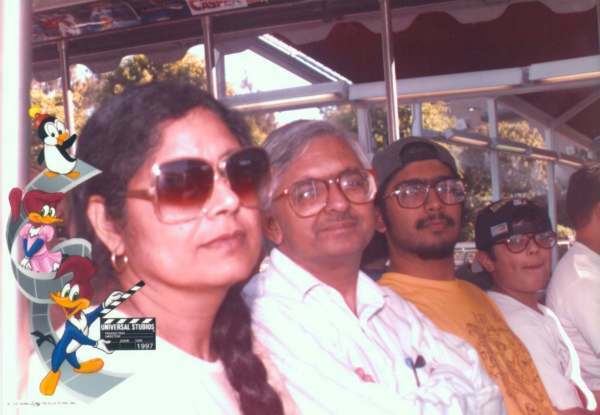 When Jaideep moved to Pasadena (Caltech) for undergraduate education, I wanted to move to California. Professor Pathria suggested that I talk to his son. I did and I joined HNC Sofwater in San Diego. The company was later bought by Fair, Isaac, now called FICO. I am retired now.